Among elevated steel water tanks, a multi-column (or multi-leg) design is the most cost-effective choice in most circumstances. The tank consists of a welded steel container supported by multiple welded steel legs, perimeter columns, and a central welded steel riser. These are reinforced with horizontal struts and diagonal bracing rods. A single pedestal tank contains a single, welded steel pedestal supporting a welded steel container. Single pedestal tanks typically require a smaller compact construction footprint and offer the benefit of less surface area, hence less expense for paint maintenance. 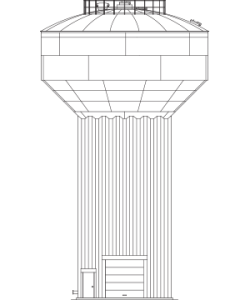 A fluted column tank is a single, steel, fluted pedestal supporting a welded-steel container. Fluted columns offer similar design characteristics and internal storage capabilities as composite tanks. The primary distinction of fluted column is their construction entirely of carbon steel. Download our brochure to learn more about how our Elevated Steel Tanks can serve you and your client’s needs. See additional Standards & Specifications here.